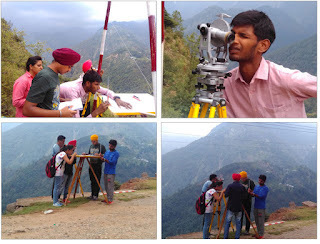 Plane table surveying is a graphical method of surveying in which field work and plotting are done simultaneously .It is mainly used for small and medium scale mapping ( 1:10,000 to 1:250,000) for plotting of topographical maps in an open area . Before starting plane table survey at first control stations are established to cover entire area, then after a suitable scale is decided. After that surveyor starts collecting details from either of the point and traverse all the stations.Elevation of points of observation are determined with the help of leveling ,clinometer telescope alidade . NOTE - Finish maps are called as "Topographical maps" and this process is called as cartography. Sighting and plotting are done simultaneously ,hence there is no chance of missing any details . Irregular objects can be plotted accurately . No great scale is required . It can be used in the area which are affected by local attraction. It cannot be done in rainy season or in thick dense forest . Plane table is heavy to carry ,accessories are liable to be lost. it becomes difficult if plan or map is to be plotted on some different scale due to absence of field notes . 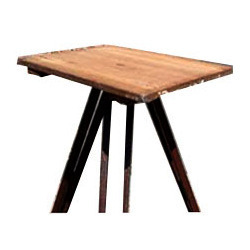 1 plane table - Plane table consist of a drawing board mounted on a tripod which can be clamped in any position . 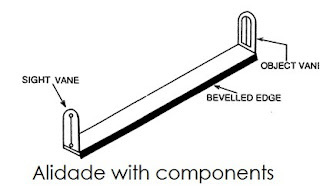 2 Alidade - Alidade is a straight edge ruler used for sighting the object and drawing lines with object vane and sight vane .Line of sight should be fiducial to edge . 3 Level tube - it is used to make drawing board horizontal . 4 Trough Compass - Trough compass is used to orient the plane table w.r.t. magnetic meridian. side of Trough compass should be parallel and plane such that they can be used as a ruler (or)for placing the compass such that it coincides with the line already drawn in N-S direction . 5 Plumbing fork - Plumbing fork is a U shape metal frame .Point of upper arm and plumb line are in same vertical line .